Only 40 minutes from Johannesburg. If you are in the market for a proper cattle or crop farm within an easy commute of Sandton and Krugersdorp or as a weekend retreat then this property is a must see for anyone wanting a serious farm close to the city. With great northerly views, the home has three bedrooms and two bathrooms and is set in a garden with shade trees and majestic palms overlooking a large ornamental dam. Close by are the large main implement and tractor barn with workshop and office as well as a fodder storage barn, the 'nagkraal' camps and the main cattle handling area. There are 5 dependable boreholes on the farm of which one is currently equipped and there are two Escom transformers of 50kva each. Historically the +/- 180ha of arable lands have been used as fodder growing areas with eragrostis or as smuts finger pastures. As a consequence the farm has a carrying capacity of about 150 LSU. Additional income has been derived from a log-cabin bush camp with a large lapa and pool area that has proven popular with city folk looking to escape the rat race on weekends and holidays. The farm also has great potential as a game farm or eco-estate. 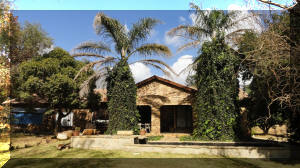 LISTED AT R7,960,000 BRING YOUR BEST OFFER.